The officer will administer a series of physical and mental examinations. Officers usually give the tests in a certain order. Usually, the first one is an eye examination called the "Horizontal Gaze Nystagmus Test." This measures the movement of the eye as the driver keeps his or her hand in one position and the eye follows an object from right to left and back again. The eye bouncing back and forth may indicate alcohol or drugs in the driver's system. The next test is the "Walk the Line Test." This is designed to measure the driver's balance. The driver is instructed to walk 9 steps in each direction, making sure to walk on the particular marked line. Often, the driver steps off the line, indicating alcohol or drug consumption. The next test is the "One Leg Stand Test." The driver is instructed to raise one foot for 30 seconds. Often, the driver looses balance and then drops the leg. The officer may also ask the driver to tilt his head back and count to 30. This is called the "Rhomberg Test." In many cases, the driver may fall over from leaning back and then concentrating on the task of counting. Hiring an experienced DUI attorney in Los Angeles is crucial to your defense. Another group of tests measures coordination. These tests include the "Finger to the Nose Test." In this test, the officer instructs the driver to close the eyes, extend the arms and touch the nose by bending at the elbow. In many cases, the driver will touch a point above, below or next to the nose. An additional set of tests determines the mental coordination of the driver. This test includes reverse counting by stating the alphabet in reverse. The officer will use a failure to compete these tests as a sign of alcohol or drug consumption. The tests are completely subjective in the eyes of the officer. In addition, the tests are not maintained on video for later evaluation by your attorney or a jury. So the reports of the officer will be used to make the driver appear to be under the influence of alcohol or drugs. The officer will be looking for any and all reasons to "fail" the driver on his or her performance in the FSTs. Certain events during performance of the FSTs will impact the driver's ability to successfully complete the tests. When the prosecutor asks the officer to show the jury how the tests were conducted, the place of "re-creation" will not be similar to the conditions when the FSTs were administered. Usually, the tests are administered at night, in colder conditions, the driver is exhausted, the grade of the footing is sloped and unsound with lose rocks. Additionally, the driver may be sick, have worn shoes or wearing clothing that limits the ability to comply with the tests. The eye exams typically involve gaze Nystagmus, an imperfect estimate by the officer of the angle of onset of the "jerking" of the eye when tracking a moving object. The earlier the onset, the theory goes, the greater the impairment. Theoretically, the officer can calculate the approximate blood level of alcohol of the driver based on the angle at which the Nystagmus begins. Even though the officer administers many tests, the National Highway Traffic Safety Administration (NHTSA) uses only three standardized tests that it feels shows any relationship between alcohol consumption and impairment of performance on the tests. Those three tests whose clues suggest impairment are the "walk and turn test", "the one leg stand test" and the "horizontal gaze Nystagmus test." All of these tests are not 100% accurate, and the conditions in which they were administered may be attacked in court. 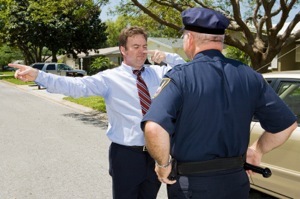 An aggressive DUI attorney will be able to attack the manner and method in which the tests were administered. Often, the officer will testify that the driver failed a portion of the FSTs. However, the NHTSA specifically warns against making a claim that the person failed or passed a test. Rather, the officer should merely note signs of impairment, rather then grade the tests. The grading can be used to attack bias of the officer against the driver. If you have been arrested or charged with a DUI offense in the Los Angeles or Southern California area, contact Michael Kraut. Mr. Kraut understands the serious nature of this offense, how best to defend you, and how to resolve your case without you going to jail. Mr. Kraut has extensive knowledge of the law and the legal system. He has developed excellent relationships with law enforcement and law officials throughout the Los Angeles and Southern California.